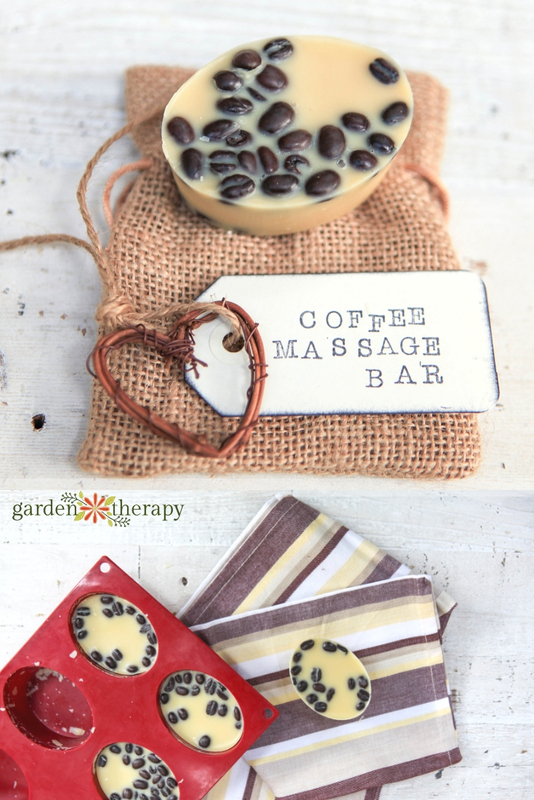 Solid massage bars are a great way to soften skin without the mess of massage oil. 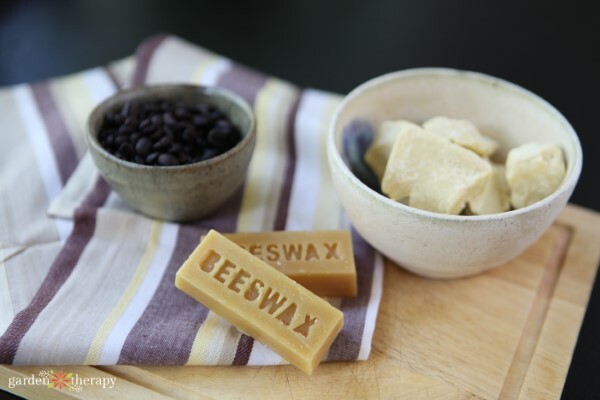 The beeswax, cocoa butter, and coffee beans add so much fragrance to this recipe that no additional essential oils are needed for aroma. 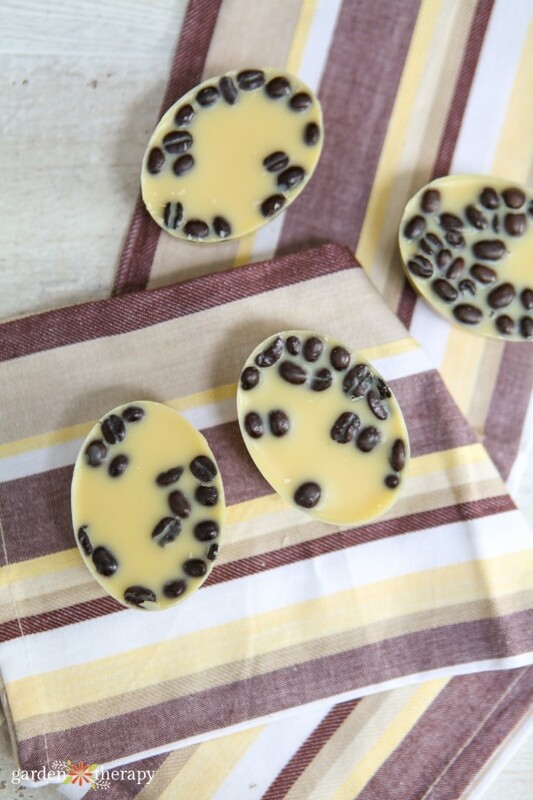 The soothing scent combination, skin-nourishing ingredients, and relaxation of a massage all come together in these coffee bean massage bars for an at-home spa experience that will make weary muscles and minds feel renewed. 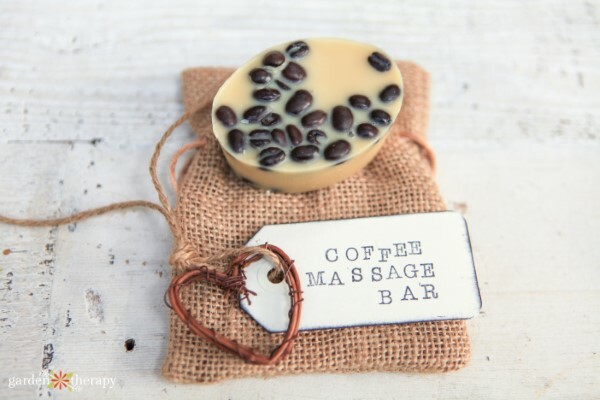 The coffee beans in these massage bars serve a dual purpose. First, those little round beans are the perfect shape to add a texture in the massage bar that feels great on your skin. Second, coffee antioxidants help to calm inflamed skin. This makes for a massage bar that’s both stimulating and calming at the same time. This might be the perfect gift for someone who you hope will give YOU a massage! 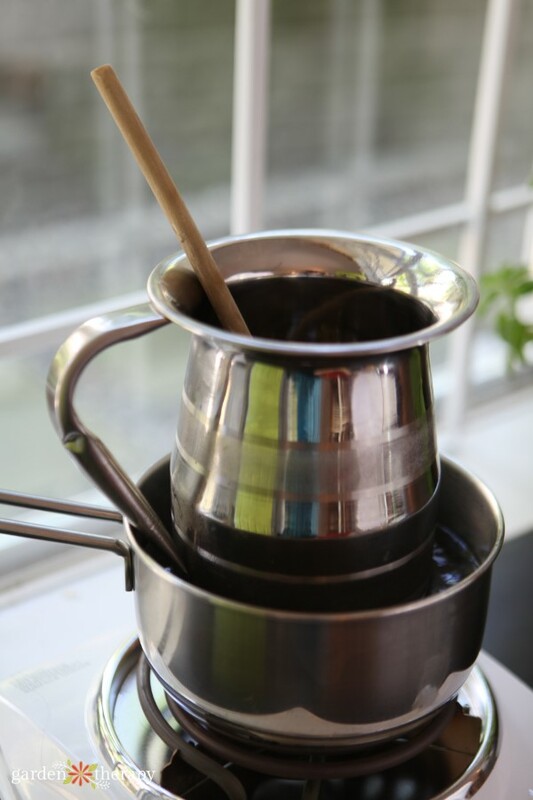 Weigh your ingredients and add them to the top pot of a double boiler. 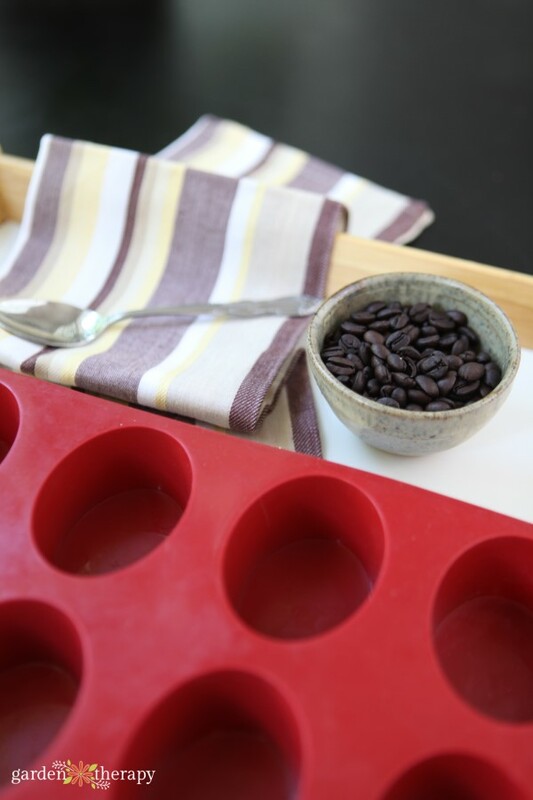 Add 2 tablespoons of roasted coffee beans evenly between four of the cups in the silicone soap mold. Stir the ingredients in the double boiler until they have all melted together. Pour the ingredients into the silicone mold, dividing the contents equally. Leave the massage bars undisturbed until they are set. 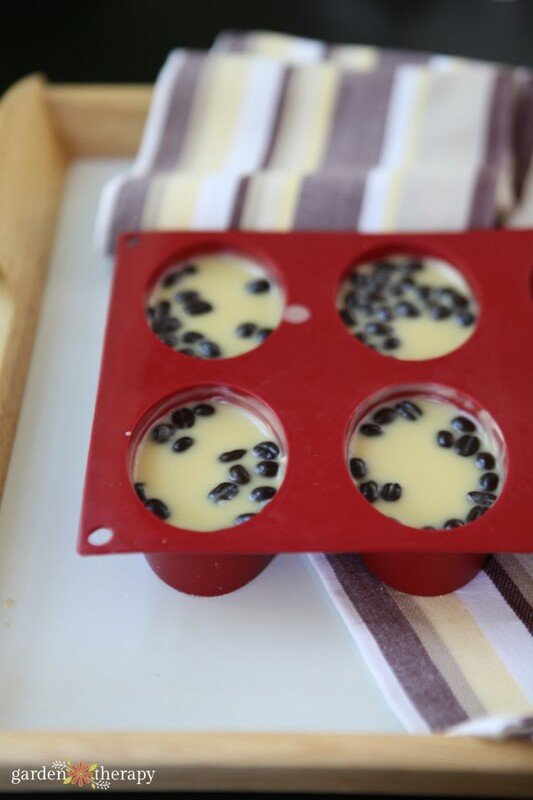 If you are making them in a warm room, move the silicone tray into the fridge to firm up. 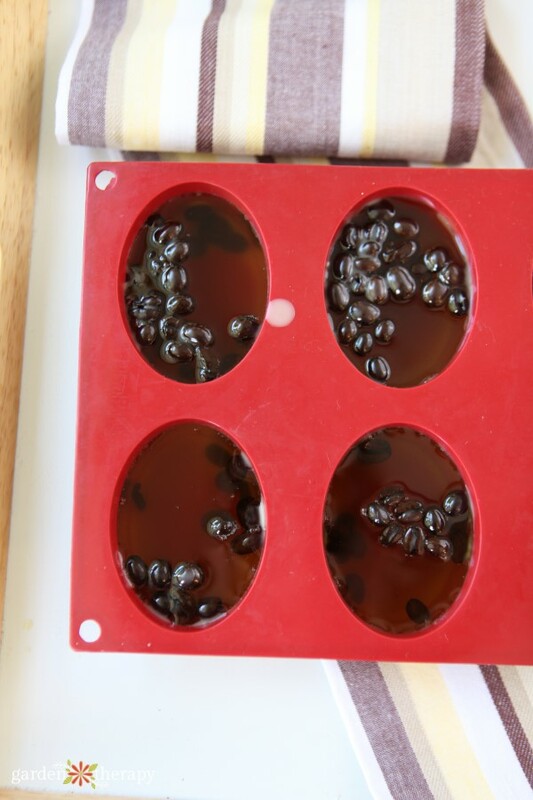 Remove from the mold and store them in the refrigerator when not in use. Package a single massage bar in a burlap drawstring bag which looks like a miniature burlap coffee sack. Use letter stamps to create a label to identify the bar. Give the edges of the label a burnished look by brushing them across the ink pad. A small grapevine heart attached to the tag and sack with jute twine finishes off the wrapping. If you like these massage bars, you’ll love my Vanilla Bean Winter Lotion Bars and Calendula Summer Lotion Bars. First, I have been receiving your newsletter only a few months and I am really enjoying it. This massage bar sounds fantastic. I would like to know if each bar is a one time use or does it last for a couple uses.